Julia Cambage understands how someone’s life can improve because of the built environment and the opportunities it can bring. 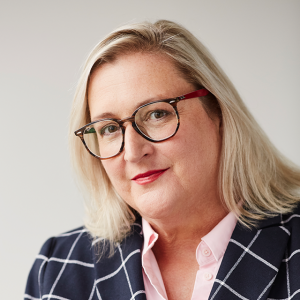 The new chief executive officer of the Australian Institute of Architects comes to the role having run a social enterprise that created innovative housing and property solutions while giving disadvantaged young people a chance. ‘I’m very interested in the built environment,’ she says. Ms Cambage joins the Institute at a time of transition and growth. As the Institute’s vision to strengthen the architectural profession and to promote the public interest through exceptional design with an ethical approach continues to roll out, Ms Cambage says she will bring the strategic skills, entrepreneurial energy and collaborative approach to ensure architects become a leading voice for progress across Australia. ‘It’s about uniting our voice and ensuring we’re able as an Institute to communicate our message very articulately and clearly to our target market,’ she says. ‘It will ultimately unite the architectural sector and allied professions across the built environment so we’re not standing alone. So we’re united as a group with others who have vested interests in making sure we’re doing good things for our communities. Ms Cambage’s work history spans the not for profit sector, procurement and hospitality, but Ms Cambage says all the roles are linked through a single theme – a strategic approach. Until recently she led the youth-focused not-for-profit TRY Australia, a multifaceted social enterprise with 450 staff and a turnover of $35m annually. In the six years she ran the charity, one of her key initiatives was TRY Build, a for-purpose business where young people at risk of disengagement gained construction and business skills by repurposing shipping containers for housing and industry. ‘TRY Uncontained and TRY Build were a part of my vision for the organisation, projects I developed and drove to where they are now,’ she says. From 2004 to 2012 she was the chief of Australia’s largest procurement company, Procurement Australia, where she oversaw more than $1 billion in goods and services; before that she ran Family Business Australia. Last year she undertook a course in Performance Measurement for Effective Management for Nonprofit Organisations at Harvard Business School – ‘an awesome experience’ – following on from postgraduate studies in entrepreneurship at Swinburne University of Technology. Ms Cambage says she is looking forward to leading in this national role and building an Institute that is ready and willing to be prominent in nation-leading issues. ‘The role of architects in the built environment is going to become more important as we look at the situation the world finds itself in – around a whole range of different man-made impacts that are going to play out in the future,’ she says. Melbourne-based, Ms Cambage enjoys ‘all the normal things’: walking her pet dog around her Mount Eliza community on the Mornington Peninsula, reading and getting out on the water in her partner Rod’s sailboat. This takes a back seat, however, to watching her superstar daughter, basketball centre Liz Cambage, play in the US WNBL for the Dallas Wings, or as an Australian representative in the Opals. As she steps into the Institute’s chief executive officer role, Ms Cambage says she is focused, calm and clear with colleagues.